Microsoft has restructured the Azure certifications, calling it “role-based learning”. These certifications are more focused on job profiles. Know everything about the new Azure certifications before you choose the right Microsoft Azure Certification Training for yourself. Microsoft Azure certification exams now focus on familiarization than memorization. In order to pass the exam, you will need to know how to do tasks via the Azure Portal, Azure CLI and PowerShell. The exams are designed to test the candidates smartly by involving case studies. Once you move to the next case study, you cannot go back. The second big change is that there are no multiple choice questions anymore. Examples of the types of questions asked are putting the tasks in the correct order, completing the drop downs with CLI or PowerShell examples, completing a series of tasks, etc. The new exam format consists of 40-60 questions, covering the latest features. You will need to score 700 out of a maximum 1000 to clear the exam. Microsoft has listed certain skill sets as prerequisite for the new Azure certifications. There is no dependency between the entry, associate and expert levels. These new role-based certifications expire in two years once attained. The transition exam is available till June 30, 2019. There are separate transition exams for the administrator, developer and architect paths. The Azure developer exams focus on C#. Microsoft grants Microsoft Most Valuable Professional (MVP) to IT professionals who make a significant positive impact on the Microsoft technical community. 70-534 exam cannot be used to transition to one of the new certifications. Microsoft has no plans to add new exams to the MCSD (Microsoft Certified Solutions Developer) yet. These changes were made after interacting with the tech community and identifying what is required to support those job roles. Hence, Microsoft Azure certifications come with added value. Multisoft Systems offers the latest Microsoft Azure Certification Training in Noida. The Microsoft Azure certification training program will help you to develop more relevant skills around your day-to-day activities. 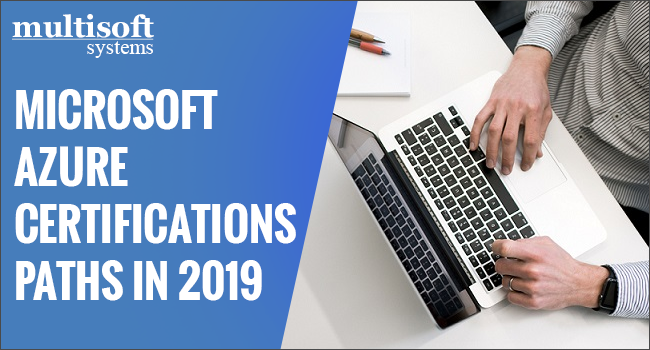 At Multisoft, you will get a thorough understanding of how to use Azure on the job to improve efficiencies and drive desired business outcomes. In 2018, Microsoft Azure had closed around multimillion-dollar commercial cloud agreement, resulting in the growing popularity of Azure cloud services among the businesses. With big companies like Apple, Ebay, NFL, Fujitsu, BMW, Dell, LG, Samsung, Boeing, and Mazda implementing Azure, greater inclination towards Azure certifications has been observed. To stay relevant and updated, it has become important for professionals to acquire the latest trainings and certifications in the market as these credentials are used by recruiters to narrow down the applicant pool.